I too was introduced to these balls in my Yoga class and looked for one that I could used at home. Thus I found them on your website. The ball is great and my husband inflated the ball for me quite easily. 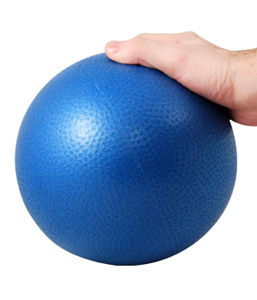 I was introduced to these balls in my exercise class and there are so many uses for them. I had to get my own to use at home, too. They are super easy to inflate and can be deflated if you want to tuck them in a suitcase when you travel. This ball is the best! I've ordered these three times now-- for myself and clients. Easy to inflate and really good quality - I've had some for over a year now and they still look new and haven't had any problems.